IRBIL, Iraq — U.S. Defense Secretary Ash Carter spent a second day in Iraq Sunday, this time assuring Kurdish leaders that the coalition will provide the necessary air resources to help their forces liberate Mosul — while also warning that the international community needs to be prepared to reconstruct the Iraq's second largest city. "We need to make sure that the non-military campaign doesn't lag behind the coalition," said Carter, who added that he's "encouraged by the progress" of the military campaign. "My mind is already thinking ahead to the desperate need for stabilization and reconstruction." While in Irbil, roughly 24 miles from the front lines, Carter told the prime minister of the Kurdish Regional Government, Necheran Barzani, on Sunday that the coalition will provide the necessary air resources to take back Mosul. Related: Mosul: Who Are Key Players Trying to Recapture ISIS Stronghold? The Iraq-led offensive against ISIS in Mosul is entering its seventh day, with Iraqi counter terrorism units and the Kurdish peshmerga encountering increased resistance from as many as 7,000 fighters. Coalition forces could face fiercer combat as they get closer to the city's center, where U.S. officials expect an estimated 1,000 foreign fighters to mount a last stand. Carter is also focusing his attention on how to defend Europe and America from potential counter-strikes by the group, also known as the Islamic State in Iraq, as the territory they control in the Middle East shrinks. "I am very watchful about attacks on the homeland," Carter said in Baghdad Saturday. "My job is to make sure Americans sleep at night and that is what keeps me up at night." Lt. Gen. Stephen Townsend, the U.S.commander of the coalition in Baghdad, said that the resistance has "stiffened in the last couple of days." He added on Sunday that Barzani and his own sources reported that the peshmerga had "considerable success" in recapturing Bashiqa, a town near Mosul. Nonetheless, Townsend said that ISIS is attempting to direct the attention of coalition forces away from the campaign on Mosul. "We have seen a complex attack on Rutbah," he said, referring to the city about 265 miles west of Baghdad. The assault follows a similar attack recently on the city of Kirkuk. As an example of the ISIS' unconventional tactics, U.S. officials cited a sulfur factory north of U.S. military staging positions that the terrorist group set on fire earlier this week. When the wind shifted to the south on Saturday, hazardous fumes blew towards a a coalition base, known as Q-West, south of Mosul. Almost 1,000 people suffered from breathing problems related to toxic gases from the fire, Reuters reported, with victims arriving for treatment as early as Friday. Some soldiers donned gas masks, while air samples were sent the U.S. Defense Threat Reduction Agency for analysis. Navy Chief Petty Officer Jason Finan's death "underscores a fact, which is what we are doing over here ... is serious business." Some Kurdish combat forces had complained that they were not receiving the air support that they expected from the coalition, but a Kurdish official said Sunday that the situation had improved. "Now we have good support," said Kurdish Brig. Gen. Halgord Hekmet. "Our number one request is armored vehicles," he said. "Most peshmerga got killed because they are riding in normal cars." Twenty five peshmerga have been killed since the operation began, Hekmet added. While officials insist that Iraqi forces are taking the lead, more Americans are in harm's way. On Thursday, Navy Chief Petty Officer Jason Finan, a 34-year old from Anaheim, California, was the first to American to be killed since the campaign began. His death "underscores a fact, which is what we are doing over here and what you are doing, is serious business," Carter said. "It's not a game." Between 100 and 200 U.S. special forces are working to help the advance of Iraqi and Kurdish forces. Approximately 5,000 American military personnel are in the country, with roughly 500 outside of U.S. bases. 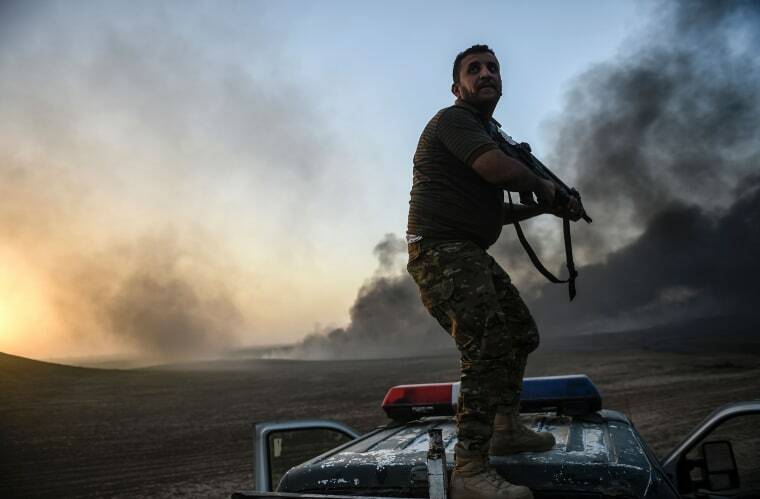 As Iraqi and Kurdish forces fight through the outer ring of ISIS' defense in Mosul, facing vehicle-borne suicide bombers and burning trenches of oil, U.S. military planners are confident of victory and already looking towards toppling Raqqa, the ISIS' capital in Syria. Meanwhile, Carter has also been attempting to mediate a dispute between Turkey and Iraq on how involved Turkish forces will be in Mosul. After meeting with Turkey's president in Anakara on Friday, Carter said that he had "an agreement in principle" on Turkey's role in the campaign. But in Baghdad, he appeared to dial down those aspirations and said the Iraqi government essentially had vetoed Turkish participation. "I also affirmed to you today the vital importance of every country operating with full respect to Iraqi sovereignty," Carter said after meeting with Prime Minister Haider al-Badi.